 Kairos: The right or opportune moment (the supreme moment); a time lapse, a moment of indeterminate time in which everything happens. Project Kairos was born when I realised the right time to follow that dream is right now – you just need to seize it. I rather love this word and it just seems to fit perfectly for all things adventurous and challenging. Pursue your passion with relentless enthusiasm and you won’t go far wrong. Over the past couple of years, I've begun to realise just how amazing Great Britain is.. and how little of it I've explored! I've also never been to Norway. What better way to solve both of these conundrums than by cycling to Norway - the long way round! The North Sea Cycle route - otherwise known as Eurovelo 12 - is apparently the world's longest signposted cycle route. I've already ticked off the world's longest coastal route so this seemed like a logical progression, right? Starting off in Scotland, the route weaves it's way down the UK and then over to France. From there I pedalled my way through Belgium, the Netherlands, Germany, Denmark and Sweden before - 70 days after setting off from the Shetland Islands, I reached Norway! Want to know what I took with me? You can find my kit list here! Check out updates from the road by searching for #GreatNorthRide on Twitter, Instagram & Facebook. You can also see the detailed route of each and every pedal stroke via the clever tracking map! Scotland's North Coast 500 had been calling to me ever since I first heard about it, soon after finishing the Wild Atlantic Way in Ireland. I actually first attempted this route in 2017, but unfortunately an injury meant I had to pull out halfway through! You can read some more about that here. Just over 7 months after tearing my quad during my first attempt, I arrived back in Inverness ready to tackle this route all over again. I used this trip as a warm up for a much bigger challenge. Like last time, I got the iconic Caledonian Sleeper train from London - arriving in to Inverness for the morning of 17th April, ready to hit the road straight away! Packing up my little road bike as light as possible, I cycled all week before hopping back on the sleeper train from Inverness to London on the 24th April. Check out the video below to see how I got on! 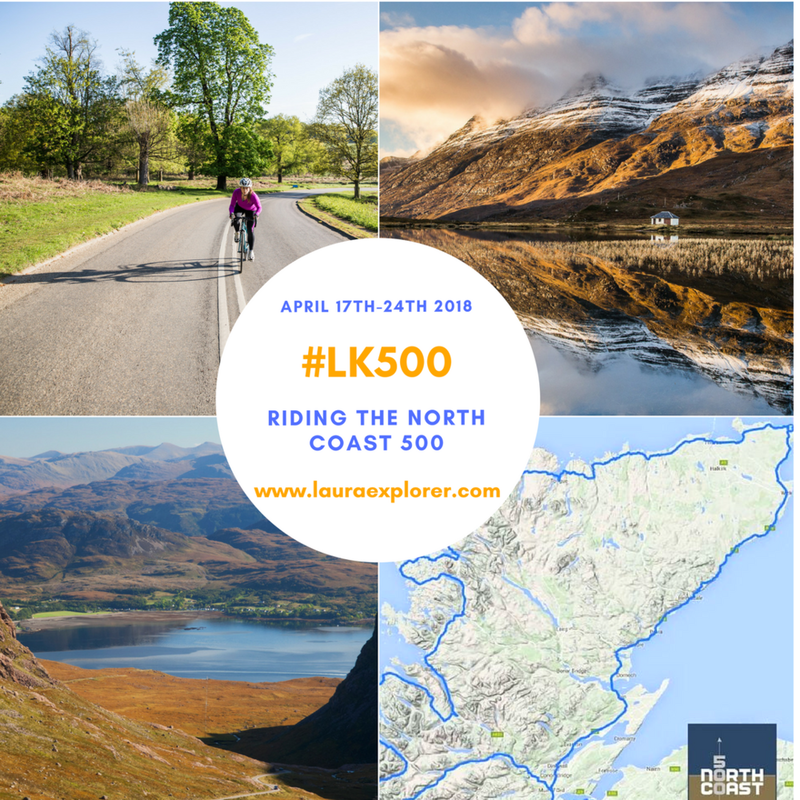 The route naturally follows the main roads along the coastal edges of the North Highlands of Scotland, taking in the regions of Wester Ross, Sutherland, Caithness, Easter Ross, the Black Isle and Inverness-Shire. It felt great to finally tick this one off the list! Discover updates from the road by searching #LK500 on Facebook, Twitter & Instagram. Follow my route by checking out the clever tracker map here. The pink line and faded mini-me represents 2017's thwarted attempt - a different coloured line represents this year's triumphant attempt! I also used my Suunto watch to record my daily stats and you can check those out on Strava! After the success of Pedalling for Patisseries, it seemed only logical to replicate the mini adventure formula – this time for pancakes! We set out from London Monday afternoon and caught the overnight ferry from Harwich, arriving into Hook of Holland Tuesday morning - from there we then pedalled onwards to Rotterdam. We were kindly hosted by my friends at KEEN on Tuesday night and after an incredibly fun 24 hours exploring, we headed back to the UK via the Wednesday night ferry from the Hook of Holland. I pedalled back home in time for lunch on Thursday. I think I was about 15 when I first heard Born to Run by Bruce Springsteen. A song I loved so much that I listened to it on repeat as I dreamt of all the travel to come and to this day, my Skype handle is “lauraborntorun”. Ironically, I actually hated running. In fact, it was the only sport I actively detested. It would be over a decade later when I would be introduced to the book Born to Run written by Christopher McDougall and it would take me even longer to “get” running. But in 2016, with the help of the Running School in London, I finally cracked it. I persevered through all the niggles and frustrations… and just kept running. By tweaking my form and improving my technique, I was able to run further and accompanying this new found running ability, naturally, is the curiosity and desire to combine running with exploring. I love endurance sports for exactly this reason – the mixture of physical effort and travel to new places. I wanted a challenge I could squeeze in to a week and, as you might be aware, I’m rather fond of islands. Amidst research, to my absolute delight, I discovered that Fuerteventura translates (according to Wikipedia...) to “great adventure”. PERFECT! Following long distance walking trail the GR131, we ran the length of Fuerteventura - 100 miles - in 4 consecutive days! A fun mini adventure to cycle 281km from London to Paris in (almost) 24 hours with some friends! Check out the quick edit of a brilliant weekend below. The Thames is the second longest river we have in the UK and a real hub of bustling cultural activity in London. It’s a river I’m extremely fond of – I often walk and cycle alongside it as I travel around London. In the run up to Christmas, a friend and I kayaked 236 miles of the Thames. I unpacked Ariel in Lechlade, near the source of the river, and finished paddling 8 days later back in London, near the iconic Tower Bridge. Check out the video below! You can also check out the updates from the road by searching for #PaddlingHome on Facebook, Twitter and Instagram. The Wild Atlantic Way in Irelandhad been on my radar for a few months and had been lurking as an ever present temptation in the background. As luck would have it, I recieved an invitation to a family wedding in Ireland– it was all the excuse I needed! The Wild Atlantic Way is 2600km long and is the world’s longest uninterrupted coastal route. I got the overnight ferry to Belfast, arriving 6:30am on August 19th, and rode the 70 miles to Derry, where the route officially begins. From here, I tracked along the dramatic and beautiful coastline until I finally reached Cork on September 16th; just in time to scrub up for my uncle’s wedding on September 18th! My trusty companion for this trip was Dory, my much loved road bike. I therefore had to pack really light as she’s not especially designed for touring. You can view the route in greater detail via out this map and check out the updates from the road by searching #WildAtlanticRide on Facebook, Twitter and Instagram. To kayak the entire length of the Volga River in Russia, from source to sea. The Volga River is Europe’s longest river. At just over double the length of Britain, it was a very apt setting for a kayak challenge! The Caspian Challenge was to paddle all 2,300 miles of this magnificent river – solo and self-sufficient. Unfortunately, due to unforeseen safety issues, the trip had to be abandoned after 6 weeks. I spent 10 days crewing on board Pangaea Exploration’s 72ft yacht ‘Sea Dragon’ from Sweden back to the UK. From Stockholm, the route took us along the Baltic and across the English Channel, stopping in Germany’s main naval base in Kiel along the way. From Kiel, we then went across the Jutland Peninsula and through the Kiel Canal, before crossing the North Sea and heading back to the UK through the English Channel. It was great to spend time at sea with an organisation that does such amazing research into ocean plastic pollution . This is such an important environmental issue and its one I really care a lot about.